Verbringen Sie einen Tag auf einer Fahrt an Kretas sonnenverwöhnter Küste auf dieser ganztägigen Bootsfahrt. Entspannen Sie an Deck und genießen Sie die Sonne und Landschaft, während Sie auf das offene Wasser des Mittelmeers segeln. Erfrischen Sie sich mit einem Bad am Almyrida Beach; erkunden Sie die Höhlen des Drepano Capes; und machen Sie das Beste aus der freien Zeit mit Sonnenbaden, Schwimmen oder einem Snack aus griechischen Delikatessen amMarathi Beach. nice tour and nice people. This was our favorite day of the whole trip. The crew was very nice and the scenery is unbeatable. These were the most clear, bright turquoise waters we saw in Greece! It was like a dream. One discrepancy is in the description it says there is snorkel gear you can use, but when we asked for it, they said they didn't have any, not because other people were using it, just because they had none, so make sure to bring your own, even if it says that in the description. The water was so clear anyway, we weren't really that disappointed, but we had left ours at home thinking there would be some to use and there wasn't. 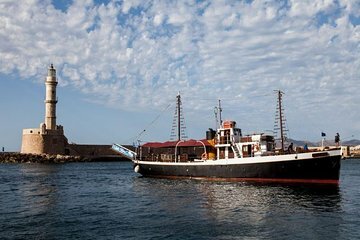 If you're looking for a way to see some different waters and beaches on Crete, I'd say this is the way to go!